Launched in 1978, this moving magnet cartridge sold for the princely sum of £37, which was a lot of money in those days for a phono cartridge. Indeed in a world where an Ortofon VMS20E at £25 was considered extravagant, the new Rega was regarded as a high end product by most British buyers. It was offered to partner the (then) new Rega Planar 3 turntable, although many Planar 2 buyers took it because it sounded so nice, and worked so well, in the Rega R200 tonearm fitted to both decks. It is very nineteen seventies in its construction, which is to say it has a plastic body and a removable stylus assembly, itself made out of plastic. Both the aforementioned were weaknesses of what was an otherwise excellent cartridge. I personally managed to crack several R100 bodies by over-tightening them in the headshell of an RB300 tonearm. The R100 simply wasn’t built for the nineteen eighties fashion of sturdy cartridge mounting hardware, and/or strong headshells. The removable stylus assembly wasn’t the most rigid, and if you were feeling really adventurous benefitted from superglueing to the body; sonically it was a revelation but it meant your next stylus change now cost £37 instead of half that! Rega didn’t quote much in the way of performance figures. It said its frequency response was “from 1Hz to 20kHz plus”, and put its output voltage at 4.5mV (at 5cm/sec). The latter was actually very good for the day, and helped the rather anaemic phono stage sections of many seventies integrated amplifiers by giving them a nice, strong, low noise signal to play with. Recommended capacitance was 300-350pf at phono input stage. The ‘Super hypo cation ellipsoid’ stylus (i.e. elliptical) tracked between 1.5g and 2.0g; Rega was absolutely correct to recommend 1.75g, where it clutched the record groove like a limpet on a fishing boat. The cartridge itself was medium mass by the standards of the day (lest we forget, ‘ultra low mass’ was the current fad) at 6.2g. Sonically, there was something special about the R100 which did not transfer to Rega’s replacement for it – the RB100, which surfaced in 1984. 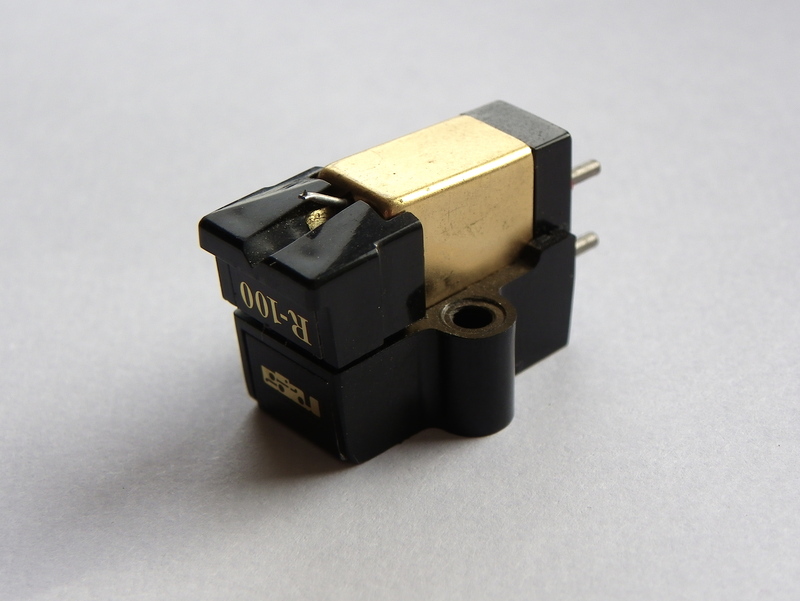 It had a wonderful richness to it which all subsequent Rega pickup cartridges have lacked. In truth it was coloured and euphonic, but there was more to it than this because it was also punchy, dynamic and unerringly musical. Indeed you could sniff a whiff of Supex SD900 in its character; it was nowhere near as detailed or as accurate of course, but there was still a family resemblance. The R100 had its own special charm, it sounded like no other cartridge anywhere near its price – save perhaps a Garrott modified A&R P77, which also had a distinctly fruity feel. By modern standards, the R100 sounds too coloured; digital audio has reminded us how recordings should sound. The Rega cartridge is a sort of pick-up equivalent to a Quad II valve amplifier; it is way off neutral yet still is wonderfully endearing and pleasant to play. Prices vary, because they are relatively rare, yet aren’t in particularly high demand. Expect to pay between £50 and £100, but make sure the body is not cracked. If the stylus is warn out, you will have to get the cartridge retipped because no replacement stylus assemblies are available anymore. Another curio from the dim and distant days of the nineteen seventies then, the Rega R100 is now long gone but not quite forgotten. Thanks for spotlight on the R-100, so little info on the web of the hidden gem. Do you happen to know the dynamic compliance figure for the R-100? Would it be a good match for a low mass arm like a Thorens TP-11? Cheers!